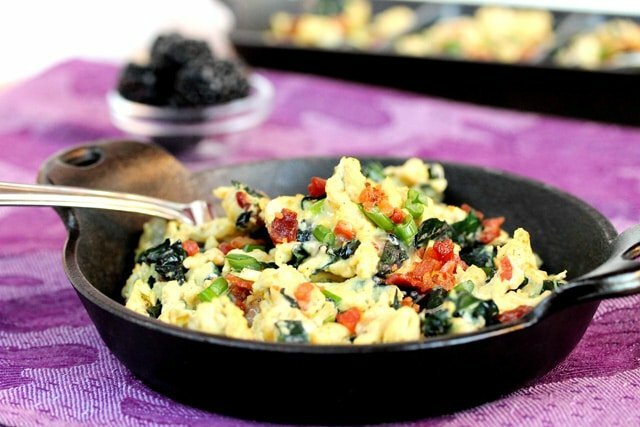 Bring breakfast to life with this quick and easy egg scramble. 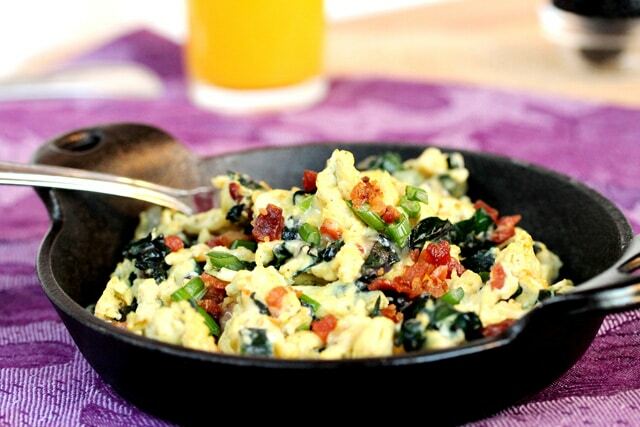 Kale adds such a nice flavor to scrambled eggs and it looks pretty too. 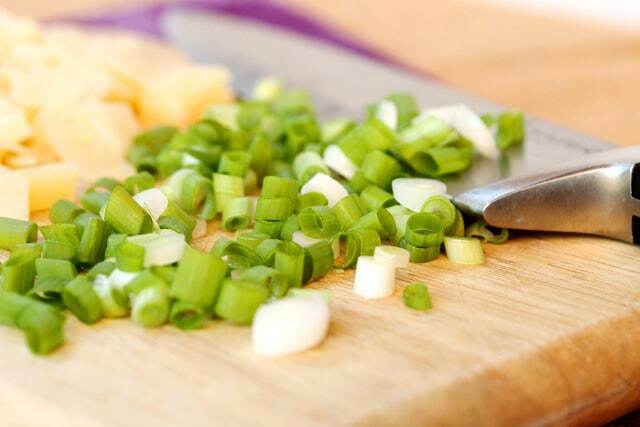 In this quick and easy recipe, real bacon bits, green onion and Swiss cheese are also added to the mix and it tastes so good together. 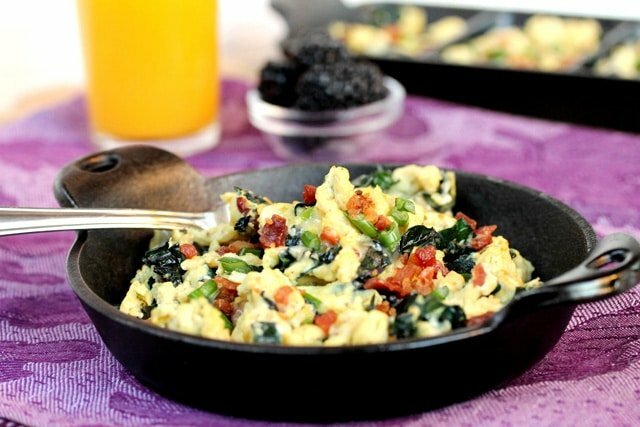 An egg scramble can really hit the spot in the morning for breakfast. But this also makes a delicious light lunch and dinner too. Breakfast for dinner is one of my favorite things to make especially because the ingredients are often on hand in the fridge. 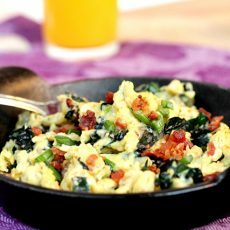 Here are more breakfast recipes you may like “Breakfast for Dinner Ideas” and “12 Easy Breakfast Finger Foods“. 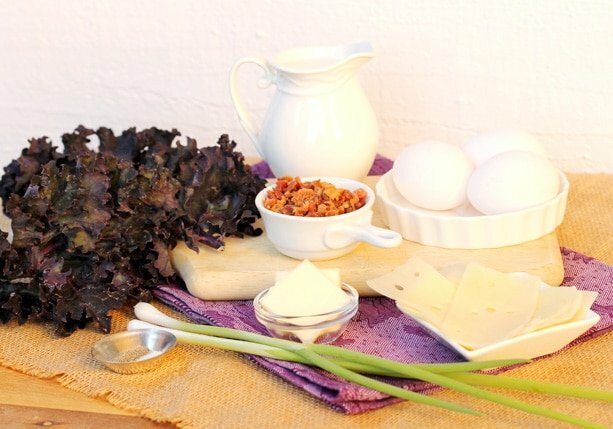 The bacon bits in this egg scramble are Hormel Real Bacon Bits that are sold in a small container located in the salad dressing section of the grocery store. They come in different sizes; bits or pieces and also in flavors like applewood smoke or jalapeno. They’re great to have on hand for quick recipes like this one and also others like “Broccoli Bacon and Mandarin Orange Salad“, “Mostaccioli Pasta with Blue Cheese and Bacon” and “Browned Butter and Lemon Pasta with Bacon“. 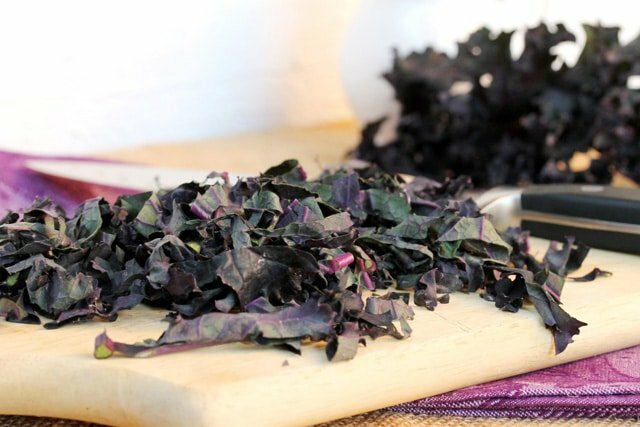 Purple kale is used in this egg scramble which has a stronger cabbage flavor than the common green curly kale. 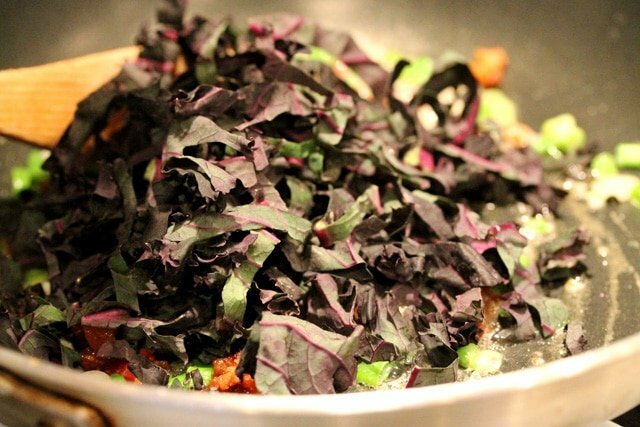 Feel free to change up the type of kale used in this recipe to the green curly version or other type you may like. 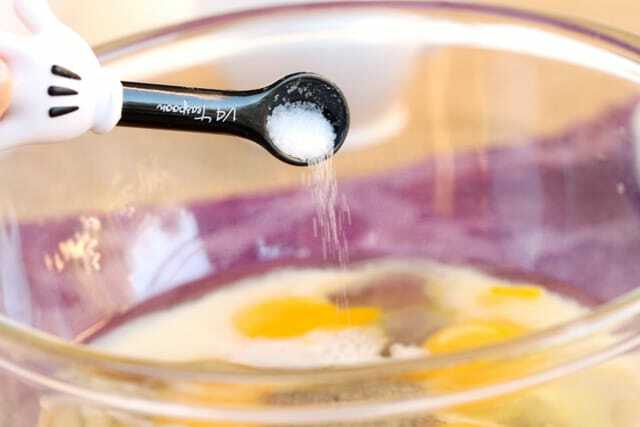 and salt (the recipe will still taste delicious if you don’t have the Mickey Mouse Hand measuring spoons…maybe not as good but real close). 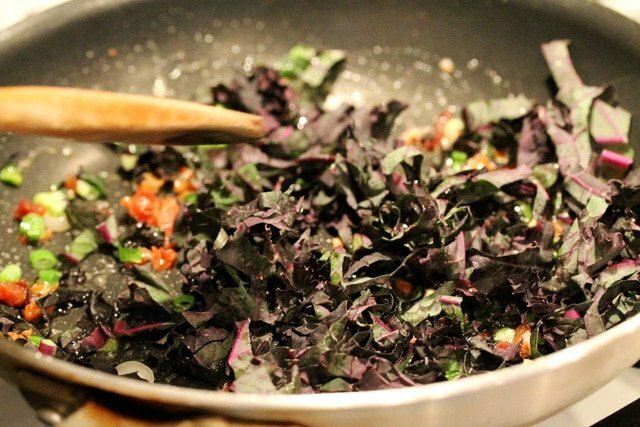 …and cook until the kale starts to slightly wilt (about 4 minutes). 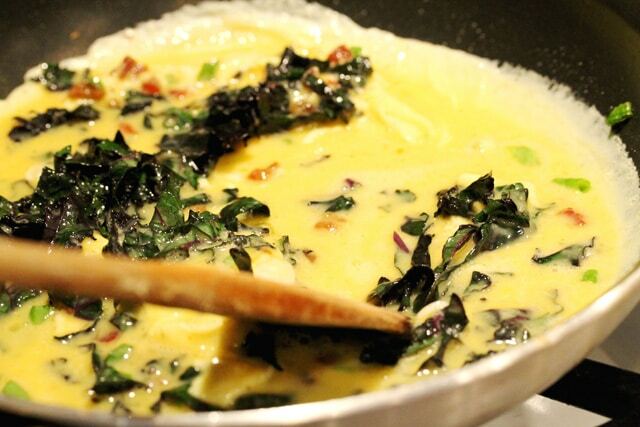 To the pan add the eggs and stir together with the kale mixture. 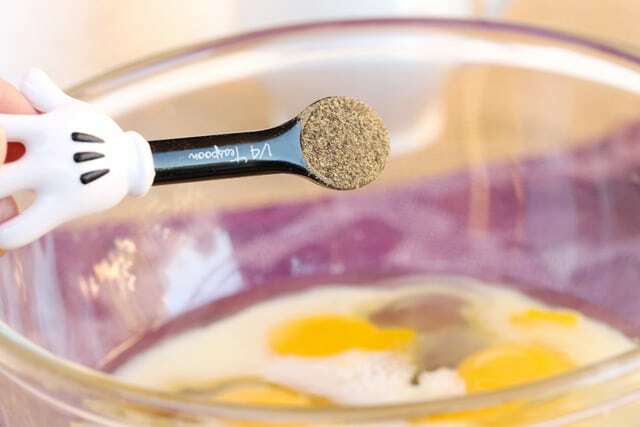 Move the eggs around with a spoon or spatula as they’re cooking. 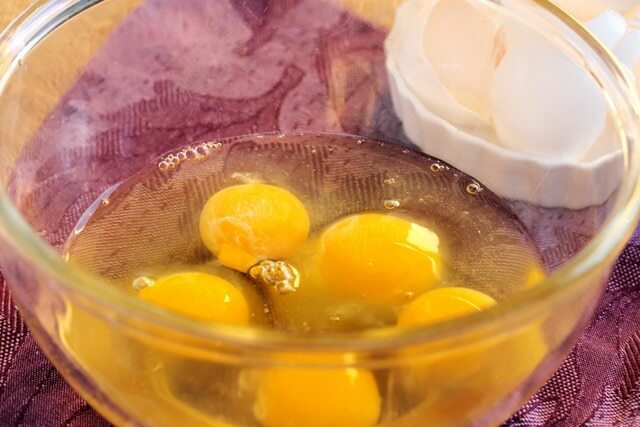 Continue to cook the eggs and stir together with the other ingredients. Just before the eggs are done cooking (about 3 to 4 minutes), add the cheese. 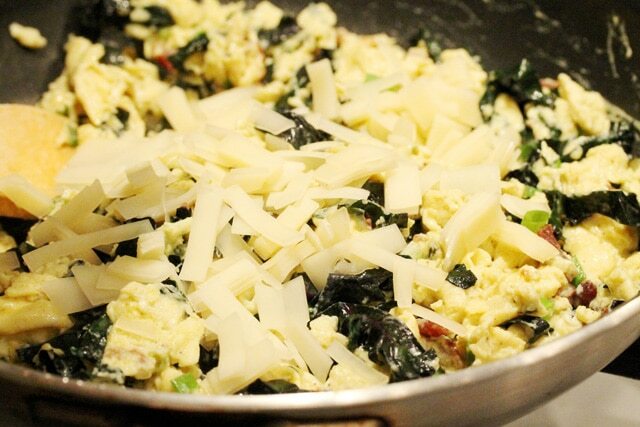 Stir in the cheese with the egg for about 2 minutes or until it melts and the eggs are thoroughly cooked. 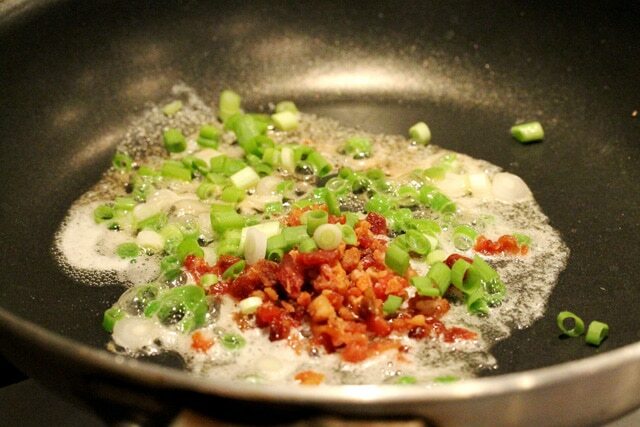 Garnish with chopped green onions and bacon bits. 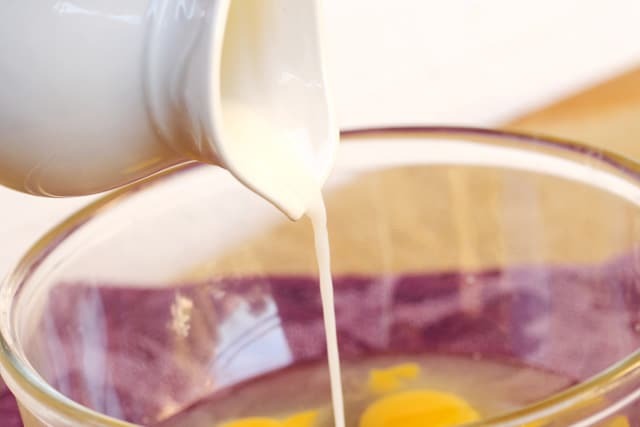 In a medium size bowl add eggs, milk, pepper, and salt. 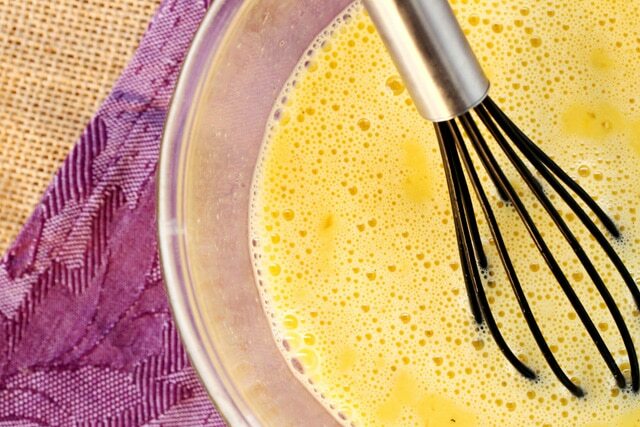 Whisk together and set aside for a moment. 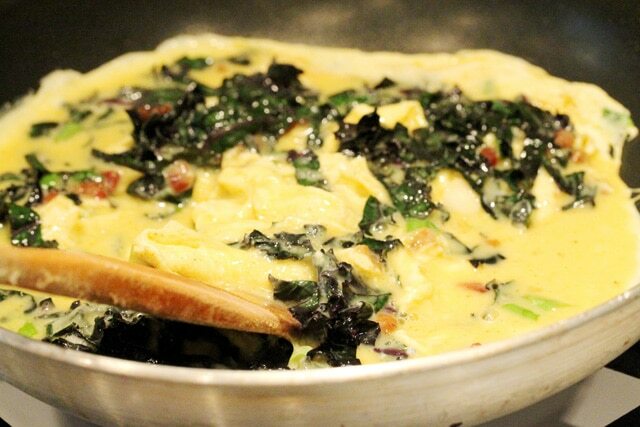 To the pan, add real bacon bits, green onions, and kale. 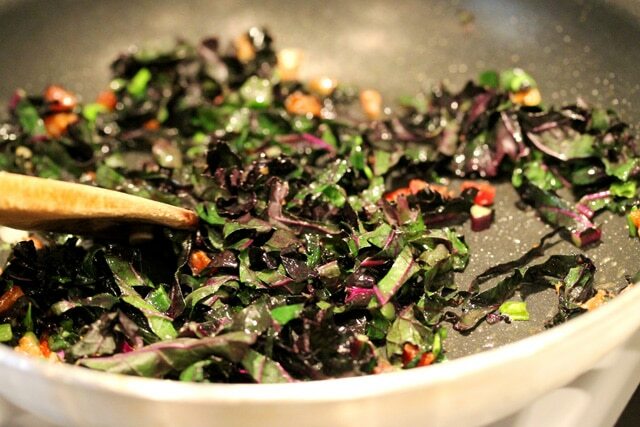 Stir together and cook until the kale starts to slightly wilt (about 4 minutes). 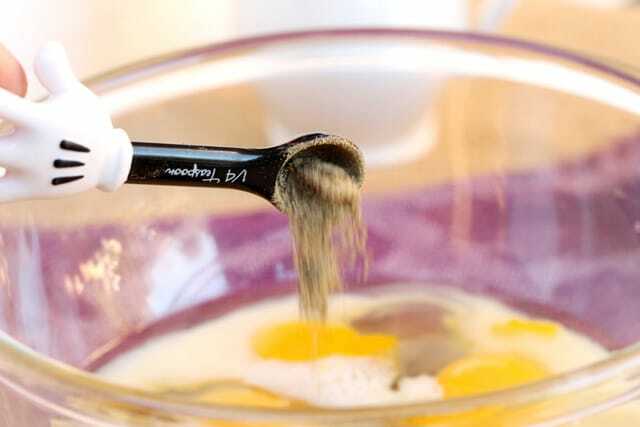 To the pan, add the egg mixture and stir. 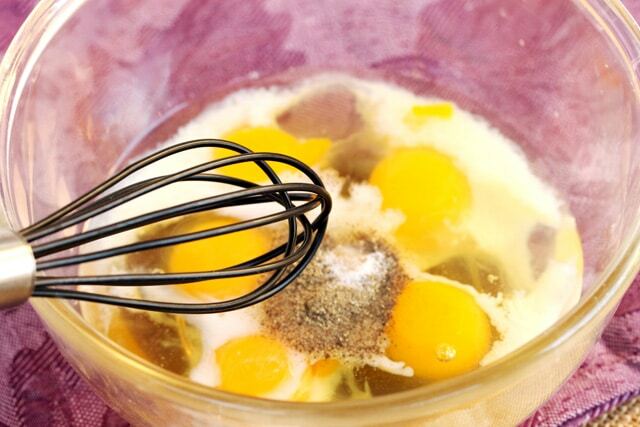 Gently move the eggs around with a spoon or spatula as they’re cooking. 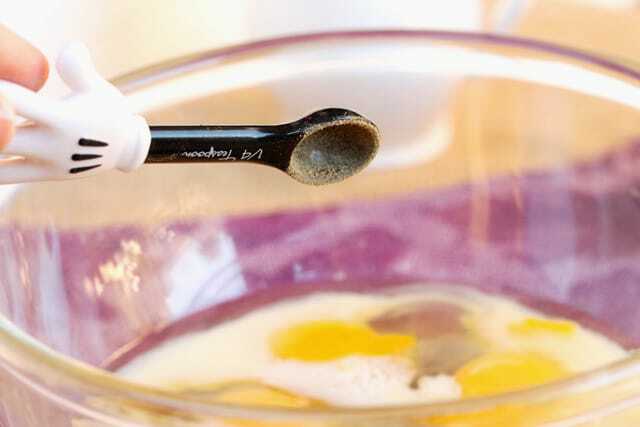 Continue to cook the eggs and stir together with the other ingredients. 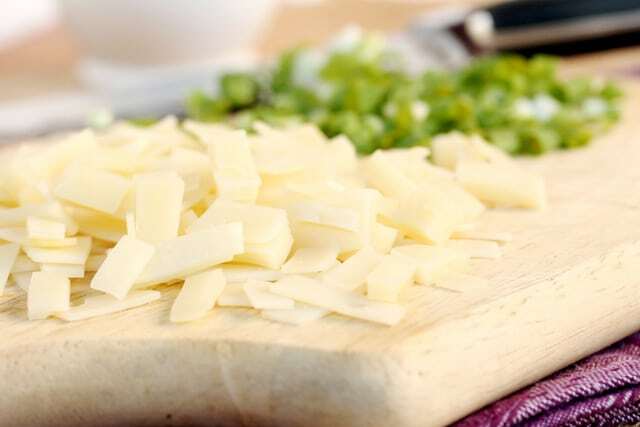 Just before the eggs are done cooking (about 3 to 4 minutes), add the cheese. 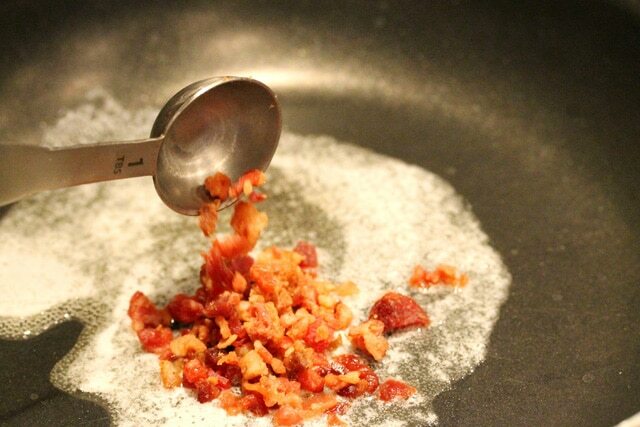 Garnish with bacon bits and chopped green onions. 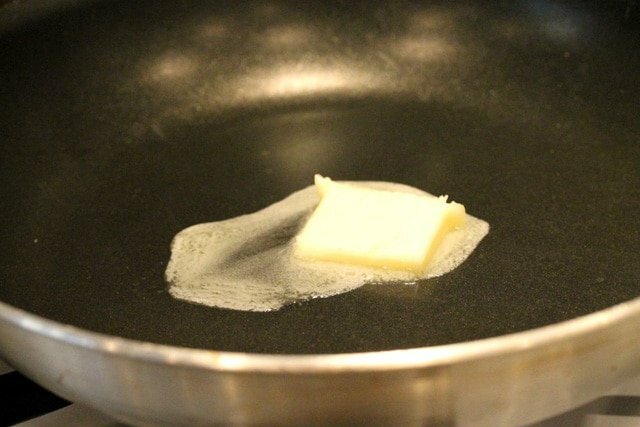 Serve right away while warm. This sounds great! I’m making this. Thank you for sharing. Hi Linda, oh good. I hope you like it. Thank you for stopping by!